The Samsung Galaxy Note 2 is currently the most powerful smartphone on the market, but would you really want to use it as your desktop PC? The Galaxy Note 2 Smart Dock lets you connect the phone to a HD monitor, keyboard, mouse and speakers, so you can use the beefy quad-core processor and 2GB of RAM inside to provide you with an all-in-one computing experience. The dock itself is relatively unassuming, nothing like the Lap Dock you got with the Motorola Atrix, but at $99 (around £60/ AU$95) it's not exactly the cheapest of accessories. The price only covers the dock itself so you'll need to provide you own HD monitor as there's no VGA port in play here, as well as an HDMI cable, keyboard and mouse. While we can't see ourselves using the Smart Dock to replace our laptop for business activities, we can certainly appreciate the advantages when it comes to media playback and sharing – providing an easy way to watch movies stored on the Note 2 on a bigger screen. 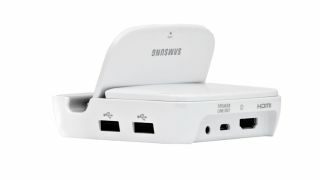 The Samsung Galaxy Note 2 Smart Dock only appears to be available in the US at the moment, but we wouldn't be surprised if it made its way to other markets soon.